Vote forSydney, NSWTop Major Destinations Which are Australia's must-visit destinations? You help us decide. Both domestically and abroad, when someone attempts to conjure up an image of “Australia” they are likely to come up only a few possible destinations that immediately spring to mind – and Sydney is nearly guaranteed to be one of them. Much more than just a bustling metropolis, Sydney is one of the beautiful harbour cities of the world, blending urban development with quality beaches, interspersed with greenery and plenty of things to see and do of both the natural and man-made varieties. It’s Australia’s flagship city, and an ideal starting point for any Aussie travel adventure. Without a doubt the city’s trademark calling card - due to its combination of vibrant layout and distinctive icons - Sydney‘s world-renowned harbour is packed full of famous landmarks such as the Sydney Harbour Bridge, Fort Denison, and perhaps above all, the iconic sails of the Sydney Opera House. It’s a place even locals can visit multiple times and still come away with a feeling of energy and vibrance as the unique buildings couple with an active foreshore and array of family-friendly attractions to form a wonderful central hub from which everything else springs. As a city, Sydney combines the best of a truly cosmopolitan urban lifestyle with the atmosphere of a relaxed and laid-back beach culture. As could be expected from a city of its size, Sydney offers a huge array of things to do for people of all tastes and temperaments – its location alongside the ocean means Sydney provides plenty of chances for water-focused activities, while also offering a vast array of cultural, historical, shopping and dining opportunities as well. There are few first-world capital cities that can beat Sydney’s combination of both urban development and idyllic weather – many can’t match NSW’s capital as a viable year-round travel destination – and as such Sydney is an easy to recommend destination of choice regardless of your travel time window. Add in the near-constant event calendar that fills Sydney’s year with the likes of festivals, light shows, musical concerts and various other artistic and culinary endeavours, and there’s always something to see, do, smell or taste. In terms of man-made attractions, Sydney is also feature-rich, with an abundance of zoos and aquariums, art galleries, museums and much more. Those with more of a bent towards nature will likewise be in their element; the city’s Botanic Gardens make for a wonderfully relaxing change of pace, there are an endless number of scenic beachfront and coastal walks, while numerous spectacular destinations such as the Jenolan Caves, Blue Mountains, and Hunter Valley are all only a day trip away. The city is likewise diverse and reflective of modern Australian society as a whole; ethnic influences abound, and as a result there is a huge melting pot of food and cuisines, cultures, architecture, music and more that can be found around every corner and within each new suburb of Sydney. With such a wide spectrum of offerings across the board, whatever the scope of your interests may be Sydney will undoubtedly be able to cater for them. Looking to pay a visit to Sydney but not sure what to do? Here are some of its most essential experiences. What's new in Sydney in 2016/2017? Sydney's iconic Vivid lights festival attracted another record showing, with over 2.3 million visitors attending the visual spectacular. A new African-themed zoo is set to commence construction in Blacktown, aiming to be the most technologically advanced in the country. The Cloud Arch steel sculpture project is a multi-million dollar construction set to adorn George Street in the city's CBD. All eyes are cast towards the pending construction of a second airport in Sydney in order to cope with soaring visitation to the city. Need more info on Sydney? Check out our detailed travel features on this top spot below. With an overwhelming array of activities and attractions for both young and old, Sydney has plenty to offer visitors of all ages both within and outside the city. We highlight 10 of the best here. While it's renowned for its sunny weather, Sydney isn't exempt from the occasional rainy day. If you're bored during a Sydney downpour, check out these top experiences for rainy days here. Sydney's a solid year-round destination due to its location and climate, yet there's one time in particular when it truly shines. We outline the best time of year to visit Sydney and surrounds here. 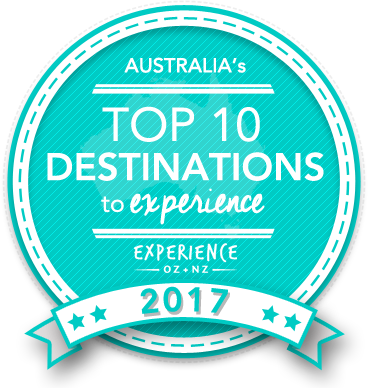 Is Sydney Australia's Top Major Destination to Experience for 2017? Vote now for the chance to WIN an epic trip to one of Australia's top destinations!